For those of you who did not get our video updates on israelvision.tv, I am sure you will find this of interest. “Behold, I will bring them from the north country, and gather them from the ends of the earth. Among them the blind and the lame, the woman with child and the one who labours with child together,A great throng shall return there. They shall come with weeping…”Jeremiah 31:8,9a. Wanting now to focus on inside of Israel, we at Israel Vision are re-posting this production from the summer of 2011. 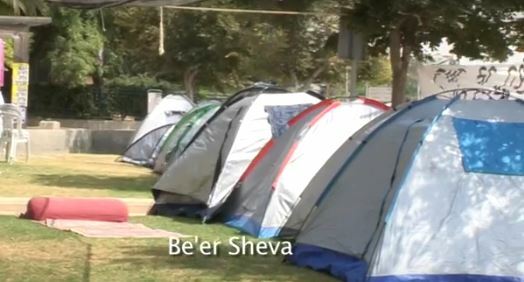 Israelis of all ages were out in protest, locally known as the Tentifada, living in tents and trying to tell the government that they must keep their promises to their citizens. Did these protests bring significant change?Israel is not a perfect country, but it is the only Democracy in the Middle East and our people for the most part remain steadfast and loyal. However, many people, young and old alike, have reached the breaking point. Today, in 2018 is again one of those times.